I’ve just finished reading Reading Ray S. Anderson: Theology as Ministry – Ministry as Theology by Christian D. Kettler (a commendable introduction to Anderson’s work). Therein I was reminded of a powerful section of Anderson’s writing on ‘Contextualizing Death in a Community of Faith and Hope’ in his On Being Human: Essays in Theological Anthropology. Anderson believed that at death we are no longer in control of our body, and that at death, if not before, the community needs to take over: ‘The community – whether represented by the congregation of God’s people or a family, or a friend, or a lover of the one who has died – must assume subjective responsibility for the body in the death of a person. To allow the body to become a mere impersonal object is to commit an indignity against the person’ (p. 142). Anderson proceeds to note that ‘that which is professional in the service of burying the dead must be continually contextualized by that which is processional’ (p. 143), and cites the importance of accompanying the dead on their pilgrimage: ‘To die without a processional which manifests that transition [to a new beginning] through the presence of the human community under the power of the divine Word is to be abandoned at the moment when one is weakest and most vulnerable’ (p. 143). ‘Ministers and their grief’, by Rose Luxford. ‘The funeral: “the service of witness to the resurrection” vs “this is your life”‘, by Allister Lane. ‘Funerals in a rural parish’, by Stephanie Wells. 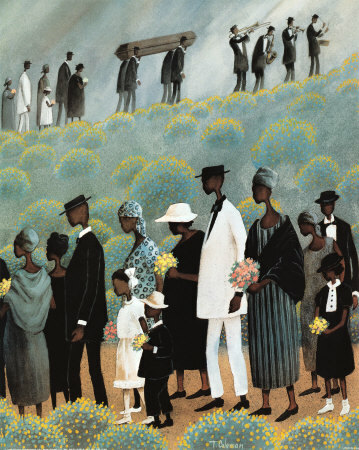 ‘Funerals: issues and reflections for ministers’, by Martin Fey. ‘Reflections of a rest home chaplain’, by Jan Gough. BTW: I drew attention some time back to Thomas Long’s book Accompany Them with Singing: The Christian Funeral (you can read the first chapter here). It really is an outstanding piece of work. Long also has a piece on ‘Grief without stages’ in the latest edition of Christian Century.